Our athletic headless male mannequin is super muscular with buff arms. Perfect for displaying sportswear and athleisure ensembles. 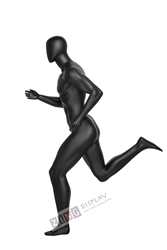 Heis in a running pose and is made of fiberglass with a glossy gray finish. Base included.